The Box Jumper by Lisa Mannetti is now available in a printed edition. This is Houdini fiction, but the plot description on Amazon is a little confusing. A customer review by "Magical" gives a much clearer sense of what this book is all about, so I'm taking the liberty of using it here instead of the official blurb. A magician posing as merely a curious Houdini enthusiast interviews one of the great illusionist's closest assistants, but as history and horror intertwine, it becomes increasingly clear that no one in this story is exactly who he or she claims to be. Skepticism meets uncertainty, fake psychics cross with dark forces, and one woman's recollections of the past unravel her hold on the present. The story works on many levels, and no matter how you interpret the various accounts, it will leave you guessing to the last page. I highly recommend to fans of dark literary fiction, historical fiction, and anyone who has an interest in Harry Houdini. -Review by Magical, August 21, 2015. 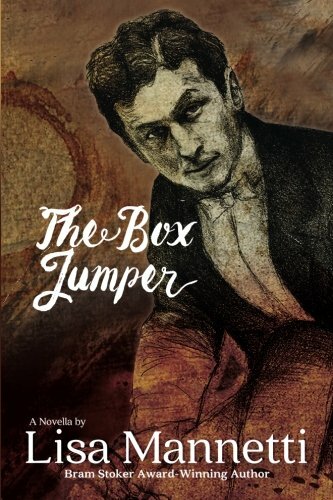 You can purchase The Box Jumper on Amazon.com (U.S.) and Amazon.co.uk (UK). Thanks for your comments--most welcome, indeed. I just want to express how much I loved THE BOX JUMPER. It is artfully written, getting creepier and creepier as the story progresses, and the paperback itself is stunning. For anyone on the fence about getting this book: Go for it!